Now, typically field service businesses won’t have customers that late on their payments. Still, when customers are late, even by a day, that can throw off the rest of your business activities. If you have quite a few outstanding invoices and you’re waiting on payment, that might mean you have to put off important purchases or payments that your business needs to make, like wages even. 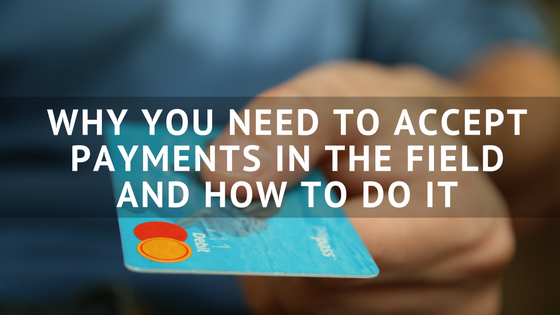 Why not implement a way to accept payment when you’re interacting with your customers? If your customers are able to pay you right after you’ve performed a service like mowing or repair, you should jump at the opportunity. Here are 5 reasons why you should accept payment in the field, and 2 ways you can start accepting payment. Late payments can kill smaller businesses. They rely on their customers to pay on time. If they aren’t able to meet their own financial obligations because of their customers inability to pay on time, they are at risk of losing employees and losing more customers. Accepting payment in the field enables you to bypass sending out an invoice, waiting for a response and then accepting payment after you’ve performed your services. If you have a customer who is willing or even prefers paying you while your field techs are on site, you should provide them with the option to do so. Another reason why you should accept payment in the field is because it gives you a chance to interact face to face with your customers. This time can be a valuable opportunity for you to build rapport with them. Being able to speak to customers opens up the door to other opportunities as well. Say you’re a lawn maintenance business that offers snow removal services in the winter, it gives you a chance to speak with them about those services, which could lead to more business for you. There is a psychological aspect to swiping your credit card to pay a service provider. Many people would prefer knowing that they’ve payed in full for the services you provided and to know that payment information won’t be lost in the shuffle or over misinterpreted over the phone. A physical transaction gives your customers peace of mind and they know they have already squared up with your business. Another reason why accepting payments in the field is a good idea is that most payment processing devices and software will integrate with bookkeeping software like QuickBooks and Sage. Collecting payment in the field in the past often created the need for the field tech to relay information to the office before anything could be entered. Like mentioned above, the relay of information opens you up to the chance of losing it before it gets entered and processed. By accepting payment in the field, you’re eliminating the risk of losing important information. Square is one of the most popular payment processing platforms out there. Their app and your online account integrates nicely with QuickBooks. It is simple to use and they also provide a free card reader which works with iOS and Android devices. They do charge a 2.75% fee per credit card swipe, however, that is a fairly standard charge for most credit card processing companies. They also allow you to manually enter information and even swipe cards in Offline Mode. QuickBooks GoPayment is also a great option which will enable you to accept credit cards in the field. It is very similar to Square, in that it connects to a smartphone or a tablet. Functionally, it is almost identical. The major difference is their pricing structure. They charge a lower per swipe fee but have a monthly service fee which you have to pay. So really, it depends on your business which would be a better fit. Since GoPayment is a QuickBooks product, it might be a good fit for businesses using either QuickBooks desktop or the online version of the software. Need a field service software that can help you manage more of your customer information AND integrate with bookkeeping softare like QuickBooks and Sage? Learn more about FieldCentral, the easiest way to take control of your business.